You've probably heard the claims by now: Here's a diet that's delicious, easy to stick with, and guaranteed to help you lose weight effortlessly. Or, perhaps it's supposed to build muscle, protect your joints or prevent Alzheimer's. Whatever the diet and whatever the claim, there's a good chance that it is, indeed, too good to be true. In recent years, high protein diets are among the most popular, whether the protein is consumed as a supplement (protein shakes for body builders!) or simply a larger than usual portion of a balanced diet (such as The Zone, Atkins or Paleo Diets). 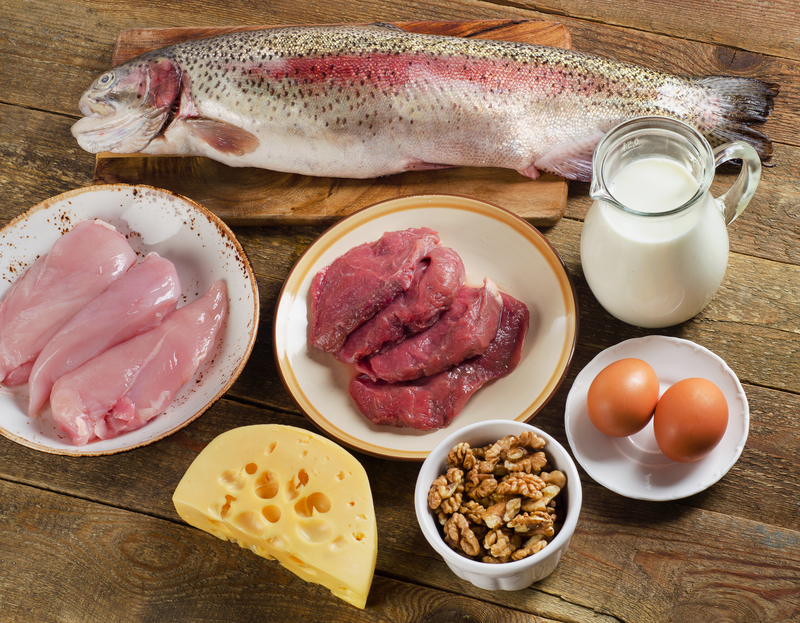 Perhaps you're curious about one of these diets or have already tried them – did you ever wonder whether too much protein might be a problem? Protein is essential for life – it's a building block of every human cell and is involved in the vital biochemical functions of the human body. It's particularly important in growth, development, and tissue repair. Protein is one of the three major "macronutrients" (along with carbohydrates and fat). So, consuming enough protein is required to stave off malnutrition; it may also be important to preserve muscle mass and strength as we age. And, in recent years, some have advocated a higher protein diet to rev up metabolism to make it easier to lose excess weight, though success in this regard is highly variable. The ideal amount of protein you should consume each day is a bit uncertain. Commonly quoted recommendations are 56 grams/day for men, 46 grams/day for women. You could get 46 grams/day of protein in 1 serving of low-fat greek yogurt, a 4 oz. serving of lean chicken breast and a bowl of cereal with skim milk. A weight-based recommended daily allowance (RDA) of 0.8 grams per kilogram of body weight. For a 140 pound person, that comes to 51 grams of protein each day. (You can convert your body weight from pounds to kilograms by dividing by 2.2; so, 140 pounds is 64 kg; multiplying this by 0.8 equals 51). Active people – especially those who are trying to build muscle mass - may need more. To pay more attention to the type of protein in your diet rather than the amount; for example, moderating consumption of red meat and increasing healthier protein sources, such as salmon, yogurt or beans. However, keep in mind these are only associations – that is, some studies have noted these conditions among people on high protein diets; but that doesn't mean the protein actually caused the condition. Also, some of these are not necessarily due to the protein itself but rather due to how the protein is consumed or what the protein replaces – for example, a high protein diet that contains lots of red meat and high fat dairy products might lead to higher cholesterol, and a higher risk of heart disease and colon cancer while another high protein diet rich in plant-based proteins may not carry similar risks. And one study found weight gain was more likely when protein replaced carbohydrates in the diet but not when it replaced fat. It's hard to provide a specific answer since so much is still uncertain and the experts themselves don't agree. However, for the average person (who is not an elite athlete or heavily involved in body building) it's probably best to avoid more than 2 gm/kg; that would be about 125 grams/day for a 140 pound person. New information could change our thinking about the maximum safe amount, but until we know more about the safety, risks and benefits of high protein diets, this seems like a reasonable recommendation. What's a protein lover to do? Choose a well-balanced diet that includes lots of vegetables, fruits, and fiber; the Mediterranean diet or the DASH diet are good starting points.